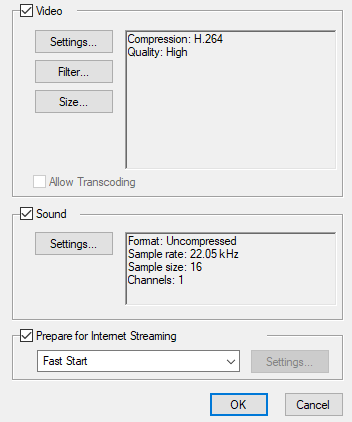 The Standard Video Compression Settings dialog box lets you configure the video compression settings when exporting a QuickTime Movie (.mov) file. NOTE On Windows, Apple QuickTime must be installed to be able to export QuickTime Movie (.mov) files. The Movie Settings dialog box opens. Allows you to select the codec to use for the video stream of your movie file. The availability of codecs may vary between machines. If you are unsure of which codec is best fit for you, it is recommended to use H.264 for maximum portability, and to use Animation if quality is more important. NOTE The Animation codec, among a few others, allows you to set the colour depth to Millions of Colors+, which supports transparency. The amount of frames per second for the video stream. Leave this setting to Current to use your project's frame rate. Some codecs compress the video by recording a limited amount of keyframes, which are frames in which the entire picture is encoded, pixel by pixel and, in-between, recording deltas, which are frames that are only defined by their difference with the previous frame. This significantly reduces the size of the movie file. However, the less keyframes a movie has, the more it is likely to encounter decoding errors, and the harder it is for players to scrub or jump to a specific time in the video. 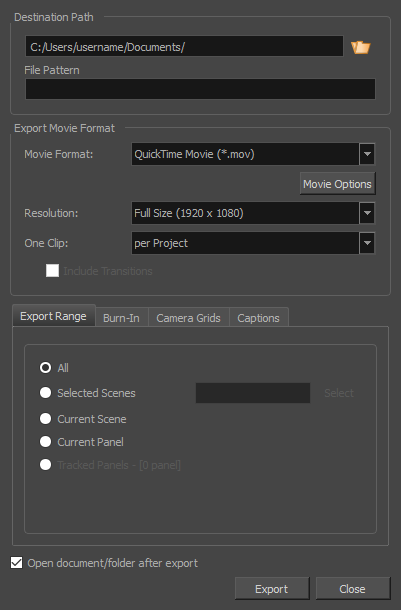 This option allows you to decide when keyframes are inserted in the video stream. Automatic: Lets the encoder decide when keyframes should be inserted. Every ... frames: Allows you to set the exact interval, in frames, at which keyframes should be inserted. All: Encodes every frame as a keyframe. This option will significantly impact file size, but will make it easier to scrub through the video without causing any rendering error. NOTE If you are using the H.264 codec, you must set the Key Frames option to All, or you will get an error message when you confirm the compression settings. Encodes frames in a different order than the one at which they are meant to be displayed. This allows for more efficient compression, but may not be compatible with some players. Allows you to set the colour depth for your video. A lower colour depth will reduce the size of the video stream but will have significant impacts on picture quality. TIP Set this to Millions of Colors+ if you want to export a video with transparency. Lets you choose a quality setting for the video compression. A higher quality setting will increase the size of the movie file, but will look better. A lower quality setting will reduce the size of the movie file, but will cause blurriness and compression artifacts to appear in the picture. Interlaced: Frames are encoded starting with their odd-numbered scanlines, then their even-numbered scanlines. Progressive: Frames are encoded whole, from the highest scanline to the lowest scanline. NOTE Some codecs will display a drop-down allowing you to select Interlaced or Progressive, while others will simply have an Interlaced checkbox. 4:3: For output on standard definition displays. 16:9: For output to widescreen displays. When exporting with the PNG compression type, this determines the algorithm with which each pixel is encoded relative to other pixels. Leaving this option to Best will export in the most space-efficient filter, without compromising picture quality. Picking a filter may increase rendering speed a bit, at the expense of some disk space. 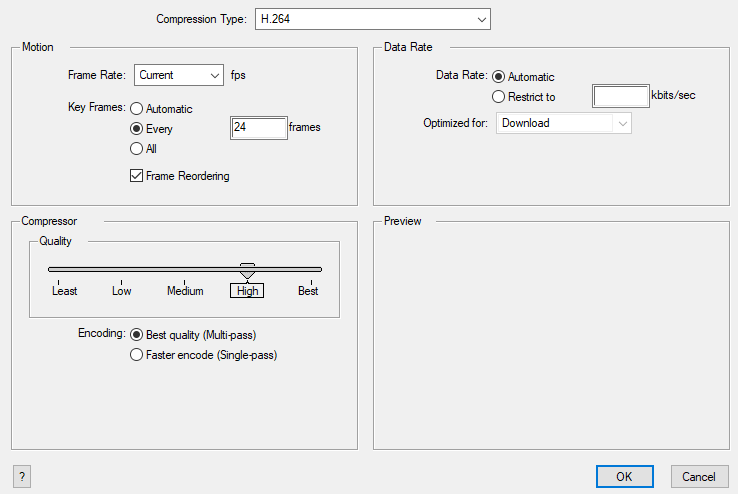 Lets the encoder use the optimal bit rate for your compression settings. Allows you to specify the encoding bit rate. NOTE This setting will override other compression settings, so that the specified bit rate is respected. CD/DVD-ROM: Optimizes the bit rate for a video that will be played using an optical disc player. Download: Optimizes the bit rate for a file that is going to be downloaded, then viewed from the user's hard drive. Streaming: Optimized the bit rate for a video that will be streamed from the web and played as the video is being downloaded.